We have an event coming up called Why Anarchy? It will be a brief introduction to the politics of anarchism, looking at media misrepresentation and history, as well as local and global perspectives, followed by a discussion. 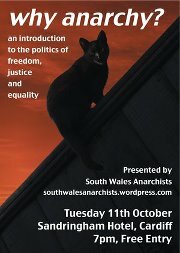 There will be speakers from South Wales Anarchists and a few others further afield. It will be from 7pm – 9pm at the Sandringham hotel, St Mary Street, Cardiff on Tuesday 11th October. Google maps link is here. Here comes the summer of rage! As the economy drops deeper into recession, and the banking elite book their luxury holidays with taxpayers money, the G20 are coming to London to rub our noses in it. Time to take to the streets. The Group of Twenty Finance Ministers and Central Bank Governors (G20) acts as a forum for cooperation and consultation on international finance. Its members are drawn from 19 of the world’s 25 largest national economies, plus the European Union (EU). These economies comprise 90% of global gross national product, 80% of world trade (including EU intra-trade) and two-thirds of the world population. The G20 are hoping to meet in London to discuss how they can keep the bankers and their rich friends in luxury whilst the recession bites into everyone else’s lives. 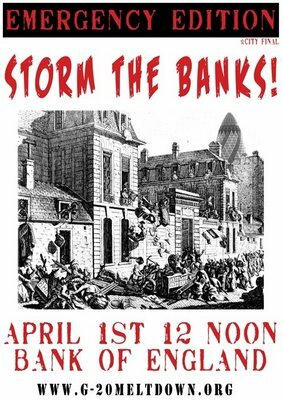 There will be numerous protests, demonstrations and actions to disrupt the summit and show the bankers and their political masters that we aren’t going to allow them to get away with the crimes they’ve committed. 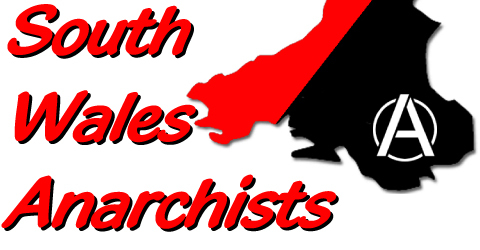 South Wales anarchists will be there. Join us!